The Thomas More Law Center (“TMLC”), a national nonprofit public interest law firm based in Ann Arbor, MI, has filed a federal lawsuit against State and County officials and employees seeking to stop a State-sponsored religious inquisition of parents who have religious objections to State vaccination requirements. TMLC brought the law suit on behalf of Tara Nikolao, a devout Catholic, registered nurse, and mother of four. Mrs. Nikolao objects to vaccines manufactured from aborted fetal cells and other vaccines on religious grounds. Her lawsuit claims that government employees violate the Free Exercise and Establishment Clauses of the First Amendment, the religious protections in Michigan’s Constitution, and a Michigan statute when they subject parents to detailed interrogation about their religious beliefs. When Mrs. Nikolao explained that she had a religious objection to vaccines, the health department employees demanded that Mrs. Nikolao explain her actual reason for objecting. Despite Mrs. Nikolao’s repeated insistence in the face of berating questions from State employees that her personal religious beliefs did not allow her to vaccinate her children—a belief that the Michigan legislature enacted a statute to protect,—the health department employees would not accept her religious objection and insisted that no religions object to vaccines. The Michigan Department of Health and Human Services (“MDHHS”) instructs local health department employees to implement this religious examination and inculcation by providing county employees with a document to “teach” parents their faith. 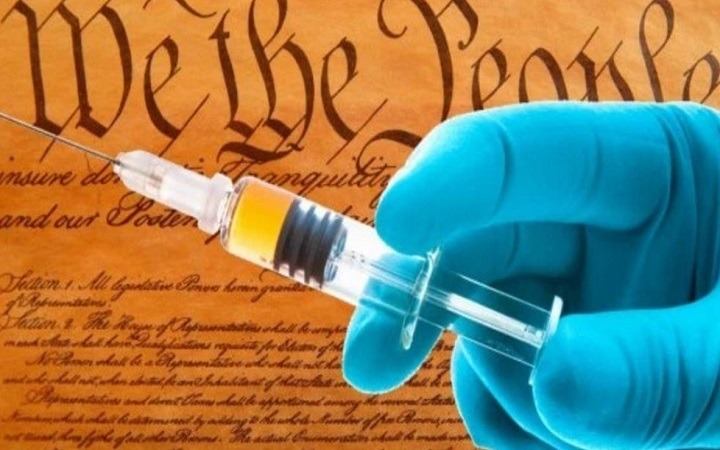 The document entitled “Religion” is used as a tool by county health departments to coerce and trick parents with religious objections to vaccines into vaccinating their children. There is no constitutional provision to allow anyone else to decide about the validity of your religious beliefs. You cannot have a society in which they legally allow you to wear a colander on your driver's license photo because "you believe in the flying spaghetti monster" - and then denigrate your valid beliefs. Factually, the Organic Documents - Constitution, Treaty of 1787, Declaration of Independence, and the Bill of Rights - are the LAWFUL basis of this nation - and this is vastly different from statutory law. ANY statutory law, ruling, "act" of congress, legislation, municipal code, etc which does NOT comply with the constitution (and the other documents which are how to interpret the constitution - common law based) is NOT a valid law - and Thomas Jefferson stated that it's our DUTY to disobey such fake laws. Their term was "pretended" law, or "imaginary" law when unconstitutional. i've seen vids of school system lawyers grilling people over their religious beliefs and the whole point is their attempting to put doubt into one's system. The point that lawyer used over and over was "if God made people capable of making vaccines to heal diseases isn't it fighting God to not take advantage of that" sort of point. The lady did not address that well at all. If you want to ascribe people's ability to God - then ask about the Tuskeegee Experiment where black men were intentionally given syphilis and fake treatments so the "good doctors" could watch the progression of the disease. Ask about the poor children in Georgia - given radioactive breakfast cereal for the same observation purposes. Either of those points alone would be enough to prove that just because of some DIvine inspiration - there is no guarantee that it is either good or effective. On the Michigan wavier there is a clause that states that the signer of the wavier is responsible for basically any other child who contacts an infection such as measles or chicken pox. It doesn't say said child became infected by the child of the parent who signed the wavier-any child that becomes infected you child is singled out without the health dept doing a PCR test to determine the strain. In signing any waivers in any state be careful to cross this section out, initial or sign it and get a copy. There is no law that says you cannot do that. From what I understand from several attorney's who have comment on this clause it is not binding. The exception to this would be in a hospital situation where you must cross out the section giving them permission to treat you with biologicals - as this means vaccines in legalese, hospital trickery. I'm wondering why she didn't apply for a regular exemption which I understand is still available in Michigan. Quick Fact: A child is exempt from immunization if a parent, guardian, or person in loco parentis of the child presents a written statement to the administrator of the child's school or operator of the group program to the effect that the requirements of this part cannot be met because of religious convictions or other objection to immunization. Medical exemptions are also allowed. As of Jan. 1, 2015, vaccine education administered and certified (signature on waiver) by local health department is required before the waiver (exemption) will be granted. Any parent/guardian who wants to claim a nonmedical waiver will need to receive education regarding the benefits of vaccination and the risks of disease from a county health department before obtaining the certified nonmedical waiver form through the Local Health Department. The new rule requires the use of the State of Michigan nonmedical waiver form dated January 1, 2015.